Flaky. Sweet. A little tart. Oh, so good. 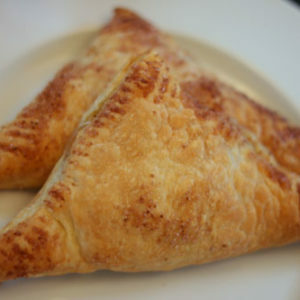 Somehow, I imagine that to most people apple turnovers are a dessert – a tasty, homey, delicious dessert. But for me? I like quiche for breakfast and easily give in to requests for breakfast for dinner. 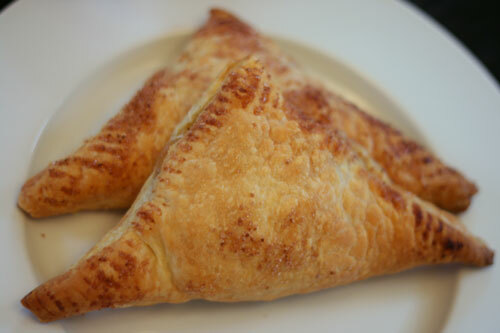 So, these turnovers weren’t dessert. They weren’t a special afternoon snack. They were … breakfast on Saturday. Hey, sometimes, you just have to have fun with food. These were definitely fun. 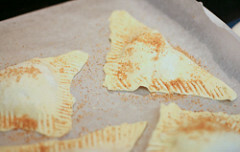 The kids loved the crispy, puffed edges and grabbed forks to devour the soft apple interior. It took every ounce of self-control not to let the kids (and perhaps me too) devour the last turnover. Making these was a cinch using my trusty food processor. After peeling and coring my apples, I used the grating plate in my food processor to shred the apples into perfect little strips. It took all of maybe 30 seconds … easy, easy, easy. As a busy mom, I totally value time savers like that. Really. But, if you are without a food processor, don’t worry — you can still make these. 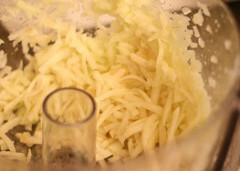 Just use a box grater instead and manually shred the apples. It won’t be that bad. However if you have a food processor tucked away, then dig it out and use it for this. It makes it so simple. Stir together those apple shreds with seasonings — brown sugar, cinnamon and a pinch of salt. Next, the apple filling is divided evenly among the centers of the rolled out squares of puff pastry, which are then folded diagonally and pressed to seal. It sounds way more intense then it is, really. It comes together so fast. Now, when I say rolled out puff pastry, I don’t just mean removed from the frozen package and unfolded. I mean actually roll it out with a rolling pin. The dough, which is warmed to room temperature, thins out easily with a few swipes of the rolling pin. Then it goes a long way. The dough will puff either way, but by rolling it out, you end up with a not-too-thick, not-too-thin dough that crisps and rises perfectly. Unrolled, it could puff too much and be too thick for little mouths to eat. Just sayin’. Almost ready to bake now … The turnovers are transferred to a baking sheet and the edges are pressed with a fork. That gives them that pretty ribbed appearance. The tops are dusted with coarse sugar (optionally, you can use course sugar mixed with a little cinnamon). The ribbing acts as a great catch for the sugar too. Then, the baking sheet is slid into the oven and a half-hour or so later out comes the wonderful, puffy, crispy turnovers. Then, all that is left to do is to devour them. Peel, core and shred the apples. In a mixing bowl, mix together the apple shreds, brown sugar, cinnamon and salt. Cut the puff pastry into four quarters. Dust a cutting board with flour. Using a floured rolling pin, roll out each square of puff pastry until about doubled in size. Divide the apple mixture evenly among the four squares, spooning into the center. 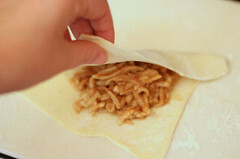 Fold the dough over diagonally and press the edges to seal. Transfer to the baking sheet. Using a fork, press the edges again to seal. If desired, brush lightly with water and sprinkle with coarse sugar or a coarse sugar/cinnamon mixture. Cook for 25-30 minutes, until lightly browned. Looks like the perfect way to start a Fall day – delish! 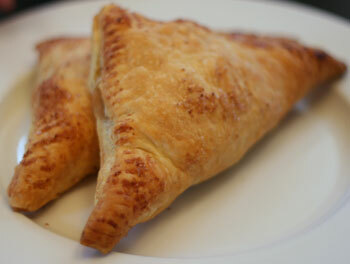 Apple turnovers for Sunday breakfast is such a great idea. Yours look so good! Using puff pastry and your cuisinart makes it look easy. Thanks for the recipe. These sound amazing. I’m sure my kids would love these for breakfast…and me too! Love something so simple like that! I bet they were so wonderful…. a dressed up apple pie! 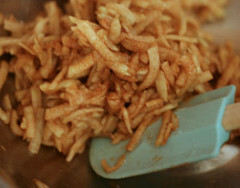 I love the idea of doing the apple shreds rather than cooking down the apples into something like pie-filling. I did a kind of apple handpie over the summer that was delicious. I’d like to try your recipe with my family now – it sounds even better!